1. Conduct yourself in a responsible manner at all times in the laboratory. 2. Follow all written and verbal instructions carefully. If you do not understand a direction or part of a procedure, ASK YOUR TEACHER BEFORE PROCEEDING WITH THE ACTIVITY. 3. Never work alone in the laboratory. No student may work in the science classroom without the presence of the teacher. 4. 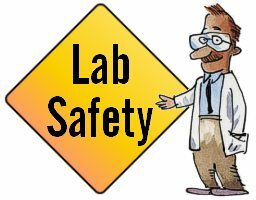 When first entering a science room, do not touch any equipment, chemicals, or other materials in the laboratory area until you are instructed to do so. 5. Perform only those experiments authorized by your teacher. Carefully follow all instructions, both written and oral. Unauthorized experiments are not allowed. 6. Do not eat food, drink beverages, or chew gum in the laboratory. Do not use laboratory glassware as containers for food or beverages. 7. Be prepared for your work in the laboratory. Read all procedures thoroughly before entering the laboratory. Never fool around in the laboratory. Horseplay, practical jokes, and pranks are dangerous and prohibited. 8. Always work in a well-ventilated area. 9. Observe good housekeeping practices. Work areas should be kept clean and tidy at all times. 10. Be alert and proceed with caution at all times in the laboratory. Notify the teacher immediately of any unsafe conditions you observe. 11. Dispose of all chemical waste properly. Never mix chemicals in sink drains. Sinks are to be used only for water. Check with your teacher for disposal of chemicals and solutions. 12. Labels and equipment instructions must be read carefully before use. Set up and use the equipment as directed by your teacher. 13. Keep hands away from face, eyes, mouth, and body while using chemicals or lab equipment. Wash your hands with soap and water after performing all experiments. 14. Experiments must be personally monitored at all times. Do not wander around the room, distract other students, startle other students or interfere with the laboratory experiments of others. 15. Know the locations and operating procedures of all safety equipment including: first aid kit(s), and fire extinguisher. Know where the fire alarm and the exits are located. 16. Know what to do if there is a fire drill during a laboratory period; containers must be closed, and any electrical equipment turned off. 17. Any time chemicals, heat, or glassware are used, students will wear safety goggles. NO EXCEPTIONS TO THIS RULE! 18. Contact lenses may be not be worn in the laboratory. 19. Dress properly during a laboratory activity. Long hair, dangling jewelry, and loose or baggy clothing are a hazard in the laboratory. Long hair must be tied back, and dangling jewelry and baggy clothing must be secured. Shoes must completely cover the foot. No sandals allowed on lab days. 20. A lab coat or smock should be worn during laboratory experiments. 21. Report any accident (spill, breakage, etc.) or injury (cut, burn, etc.) to the teacher immediately, no matter how trivial it seems. Do not panic. 22. If you or your lab partner is hurt, immediately (and loudly) yell out the teacher's name to get the teacher's attention. Do not panic. 23. If a chemical should splash in your eye(s) or on your skin, immediately flush with running water for at least 20 minutes. Immediately (and loudly) yell out the teacher's name to get the teacher's attention. 24. All chemicals in the laboratory are to be considered dangerous. Avoid handling chemicals with fingers. Always use a tweezer. When making an observation, keep at least 1 foot away from the specimen. Do not taste, or smell any chemicals. 25. Check the label on all chemical bottles twice before removing any of the contents. Take only as much chemical as you need. 26. Never return unused chemicals to their original container. 27. Never remove chemicals or other materials from the laboratory area. 28. Never handle broken glass with your bare hands. Use a brush and dustpan to clean up broken glass. Place broken glass in the designated glass disposal container. 29. Examine glassware before each use. Never use chipped, cracked, or dirty glassware. 30. If you do not understand how to use a piece of equipment, ASK THE TEACHER FOR HELP! 31. Do not immerse hot glassware in cold water. The glassware may shatter. 32. Do not operate a hot plate by yourself. Take care that hair, clothing, and hands are a safe distance from the hot plate at all times. Use of hot plate is only allowed in the presence of the teacher. 33. Heated glassware remain very hot for a long time. They should be set aside in a designated place to cool, and picked up with caution. Use tongs or heat protective gloves if necessary. 34. Never look into a container that is being heated. 35. Do not place hot apparatus directly on the laboratory desk. Always use an insulated pad. Allow plenty of time for hot apparatus to cool before touching it.